i collect. it's what i do. junk is the pulp of my product....so, naturally, my quarters can get a bit cramped at times. and when people come to visit, it's motivation to purge once again. because, really folks, i'll find it all over again....makes no difference to me. so, who's coming to my studio, you ask? i'm proud to announce it's jeffrey crussell from crussell fine arts. he saw my pieces on view currently at the i-5 and wants to see more. Congratulations Miss July!!! Your studio is a LOT neater than mine right now. proove it! take a PiCTURE....i dare ya! hee heeeeeee. See my latest post. Oh it's bad. Makes me want to clean it up and repost a happier picture. thanks muchly! i'll flaunt my miss july-dom proudly! Great news! I should get moving and start marketing myself. 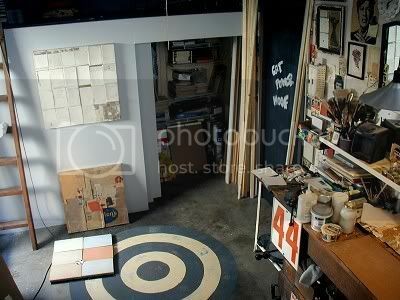 Your studio is much bigger and neater than mine. By the way, you should get yourself one of those sashes to wear so everyone will know who you are-'Miss July'. Now I'm singing, "My angel is the centerfold. . ."
thanks for the d-lish postal card! i'm v. flattered that you mem-o-rized my addy! oh, loddy, the stories i could tell you after the week i've had. expect more postals soonly. the visit happens tomorrow, and i'm most hopeful and dreamy...thanks for your well wishes.